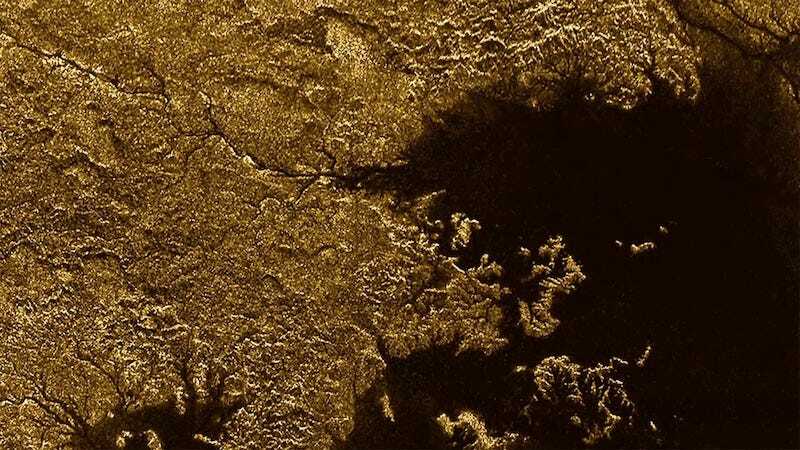 A network of dark canyons lines Saturn’s moon, Titan, but just what’s inside those trenches has remained mysterious—until now. Researchers just confirmed that those canyons are flowing with liquid methane. Scientists had spotted the dark canyons on the surface of the moon years ago. But they weren’t sure yet if what they were seeing was flowing liquid, like they’d also seen in the moon’s methane seas, or just some really dark rocks. The answer to that question finally came when NASA’s Cassini radar spotted glints off of the canyons’ surfaces, just like the ones that had been spotted on the moon’s smooth seas. In addition to confirming that the canyons were also filled with liquid methane, the radar measured just how deep they extend. At their lowest depths, the canyons dip to a level of 1,870 feet deep. The next question, though, is how liquid methane carved those canyons. Researchers have already noted how similar Titan’s canyons look to deep canyons on earth. Although those were carved with liquid water, not methane, researchers suspect that the processes could be very much the same.